You can easily set up payroll direct deposit in QuickBooks Online. 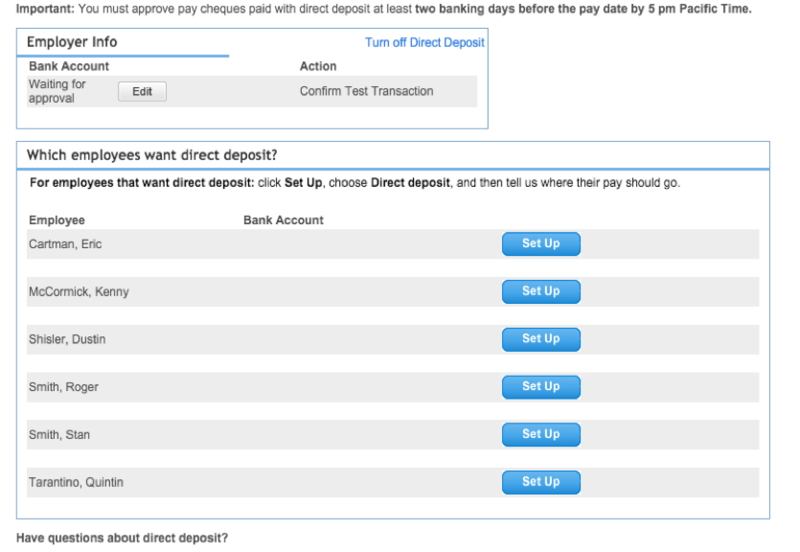 After you do the initial set up you can set up each employee on direct deposit and also verify your test transaction. You must approve pay cheques that are being paid through direct deposit by at least 5 pm PST, two banking days before the pay date. It can take up to three days to complete the Risk Analysis after initial set up. Double check that all account numbers and information are correct. Incorrect information can cause a delay or result in funds not being sent to an employee. A best practice is to begin direct deposit set up the day after running a payroll with paper cheques to ensure you are not in a ‘Pending’ state when it’s time to run your next payroll. Direct deposit set up and verification can sometimes take up to a week. The Principal Officer is the owner of the bank account being set up for direct deposit. Email communications for direct deposit will be sent to the Master Administrator (MMA) on file, but the AML/OFAC email and the verify bank account email will go to both the Principal Officer (bank owner) & the MMA. Most companies will receive an AML/OFAC email from notify@quickbase.com requesting proof of identification and more info. The Principal Officer must respond to this email with the appropriate documentation prior to using direct deposit and it can take up to two business days to approve once the ID is submitted. Note: Review the direct deposit processing timeline for information on how long the direct deposit process will take once you've submitted payroll. Under Payroll, select Direct Deposit. Review what you'll need to set up direct deposit and select Yes! Let't get started. Fill in required fields for Employer Bank Account and Account's Principal Officer. You'll receive a confirmation email from notify@quickbase.com prompting you to verify your information. Once the information is verified, you'll receive another email confirming your pre-authorized debits. After successful verification, you're ready to set up employees! Select Yes! Let't get started. Select the Edit button next to the Bank Account field. Input the following number sequence into the bank account field: 123456789. Immediately go back into your Payroll Settings from the Gear icon and select Direct Deposit. Re-enter the correct bank account number and save the changes. This should re-trigger QuickBooks Online to send the test transaction to your bank. Please wait another three business days for the transaction to appear on your bank account. Note You have three attempts to verify your test transaction. If you aren't successful, contact us for assistance. Ensure the employee has properly filled out the Direct Deposit Authorization Form. Once you've completed the initial set up your direct deposit settings screen will look like this. Select Set Up beside the desired employee. From the What do you use to pay Employee? drop-down arrow, choose Direct Deposit. Fill in the fields using the information from the employee's authorization form. This completes the set up process and you're now ready to use direct deposit to pay your employees. Direct Deposit (DD) can take up to 1 week* (longer, if there are any delays or errors) to get set up, depending on if there are errors. Best Practice is to have customers start this process the day after they run a payroll with paper cheques to ensure they are not in "Pending" status for the next payroll run. Encourage customers to double-check ALL ACCOUNT NUMBERS and banking information as they are entering information to set up Direct Deposit (DD) for Payroll. Incorrect numbers/information may result in delays in the DD process, funds being deposited to the incorrect account, and/or additional fees for DD reversals. The Principle Officer's information refers to the Primary Owner of the Bank Account the payroll cheques will be withdrawn from. The Risk Analysis can take UP TO THREE BUSINESS DAYS to complete after DD set up. All communications to the MMA on the file, with the exception of the verify test transaction and AML/OFAC email, which goes to the Principal Officer (Bank Owner) 24-48 hours after sign up, the Principle Officer will be sent an email to submit their ID’s to the compliance team to remove the AML/OFAC Blocking and the customer can then start using our direct deposit service. All email communications for DD WILL BE SENT TO THE MMA on file. If that role is being filled by an Accountant or Office Personnel, it is up to that person to communicate this information to the Owner or other people the messages pertain to. If customer does not see this transaction after three business days after entering DD information in Payroll Settings, have the customer put 123456789 in the bank account field and save the changes. Then, have them immediately go back into Payroll Settings>Direct Deposit and re-enter their correct bank account number and save the changes. This should re-trigger QBO to send the test transaction to their bank. Have them wait again for three business days for that transaction to appear on their bank's website/account. Customer will receive an email with a link to upload their ID to the compliance team. If they have not received the email, reach out to a Lead to get the email resent. Customer can go to Gear>Payroll Settings>Direct Deposit>Verify Test Transaction to enter that amount there. If the customer can't verify the test transaction on their own for any reason, follow the steps below and have the customer read the amount to you. Ask the customer for their test transaction amount and enter it in CS Server.